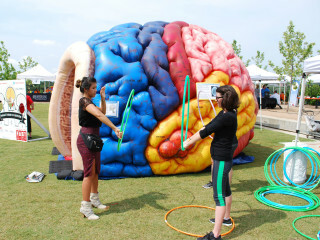 Participants of the UTHealth Stomp Out Stroke Festival will learn lifesaving information about stroke and brain health, enjoy free health screenings, fitness & nutrition demonstrations and Q&A with stroke physicians, nurses and pharmacists. This event will also feature stage performances by the Lion Dancers, Ready Super Heroes, McTeggart's Irish Dancers of South Texas and Mixfitz TurnUp fitness with Crystal Wall. There will also be face painting, balloon art, hula hoop fitness, bubbles, giveaways, door prizes and music by DJ Pancake Afternoon performances feature Young Lyric, Houston's “Hip Hop Princess," Shingari's School of Rhythm and Mixteco Ballet Folklorico.